I have a new job, which has me working out of a warehouse across the street from an air base/municipal airport (Westover). 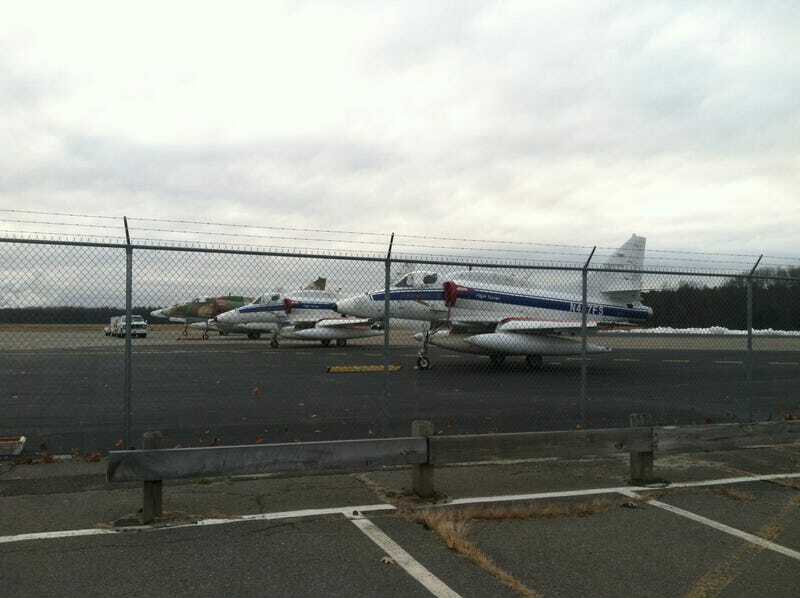 This morning on the way into work I saw these four planes parked next to the fence by the "passenger terminal" (a small building, 100x100 at most, used for charter jets. There are no regular commercial flights from Westover). I've never seen these planes in the area. When I came back in the afternoon they were flying overhead, and I think I saw two more (painted flat grey) parked in one of the "civilian" hangers. Any idea what the are/whose they are? If you can't tell from the photos, they're single engine. The white ones say "BAE Systems / Flight Systems" on the tails and "EXPERIMENTAL" on the blue stripe below the canopy. They also have ejection seats and pilot call signs painted on just below the canopy glass. So, who can tell me what/who our guests are? Also spotted at the airport today: a KC-10 doing touch-and-gos (second time in a week), the standard static line of C-5s and a pair of large private/charter jets by the terminal. Really wish I'd taken a photo of those as well. Next time.